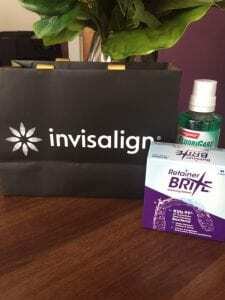 When I first agreed to have Invisalign® I was really excited as I love improving myself , whether it is mind, body or soul! 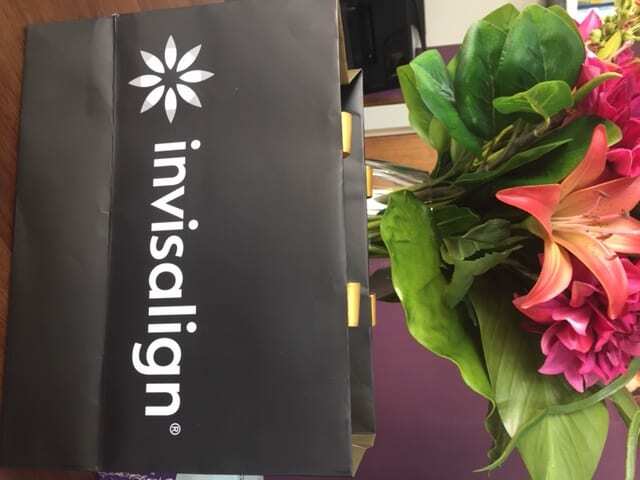 So can you imagine my excitement when I received this Invisalign® bag of goodies which are made of really good quality products and fabulous marketing in a quality bag with gold ribbons!! In the bag I received a full size bottle of Colgate FluoriGard fluoride rinse solution with daily cavity protection in mint flavour which was also alcohol free! (shame!) lol That’s mouthwash to you and me. It’s specially selected by Dentists as it has a triple action formula to reduce the formation of plaque acids, to prevent mineral loss caused by plaque acids and to promote re-mineralisation of early decay to keep your teeth in the best condition which you are on your Invisalign® journey. We all know that oral hygiene and good dental health are paramount for a healthy lifestyle and to maintain healthy teeth and gums. In this bag I received one month’s supply of Retainer brite cleansing tablets which contains 36 tablets. It is recommended to use one tablet a day every day to ensure that your aligner trays are kept clean, fresh and are not collecting debris which could be harmful to your teeth. I’ve been using this religiously while I have had my breakfast as it says to leave the aligners in a glass of cool water and drop in the tablet so it fizzes and cleanses the clear aligners as it goes. I then rinse them thoroughly under the cold tap and give them a quick brush with my toothbrush to remove any stubborn bits that may have stuck there. It’s been easy to do so I’ve woven this in to my daily morning routine. Some lucky clients may also receive a travel pack of goodies which consist of a mixture of a sample of toothpastes, a travel toothbrush, some coloured Teepees which come in yellow, red, blue and orange to show the different sizes of inter-dental brushes, in a handy zip up case for when you are travelling overnight or perhaps for a weekend away! No, not the chewing gum that you loved as a kid, the special chewy aligner tray seaters that you put in your mouth and chew for 2 minutes which help the aligner trays to bed in when you first receive them. It can also help with any initial discomfort but tbh I didn’t have any pain or discomfort, in fact I was expecting a LOT more! The Instructions are written for an international audience, but luckily English is easy to find and it’s on page 2. 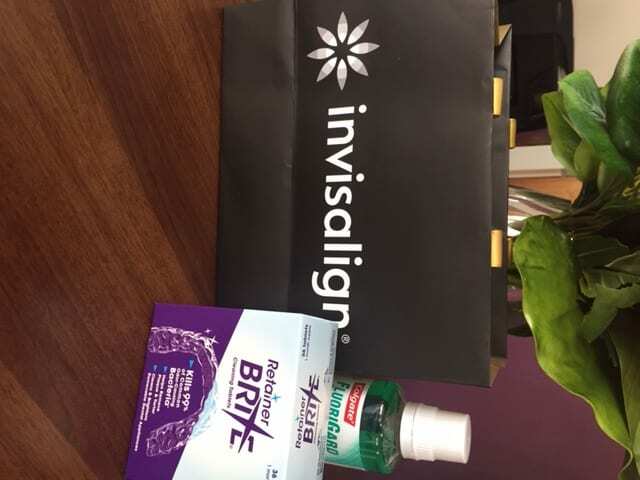 This helps as a reminder for you in case you forget what you should do during your journey to keep your aligners and your dental health in tip top condition. 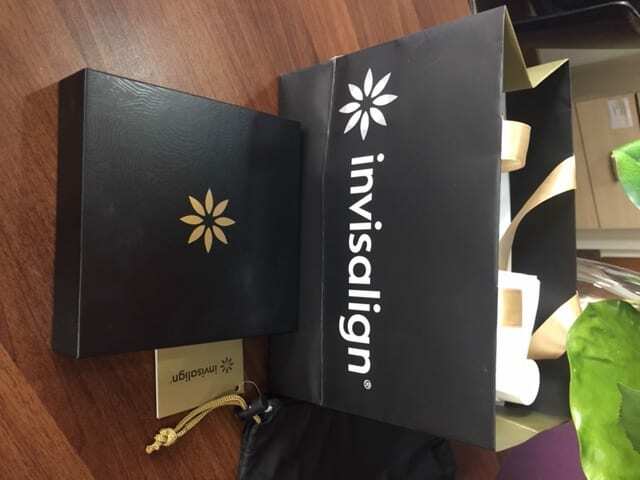 I was impressed by the high quality of the black and gold presentation box which contained my round aligner box (as Mandi says, this is your “friend” while you are having Invisalign® and should be taken with you everywhere you go so you don’t lose your aligners on the move or in a restaurant etc. 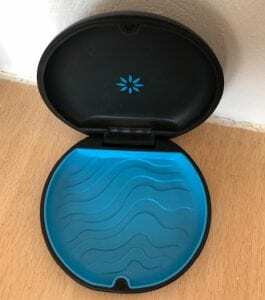 They also contain a smaller pack of cleaning crystals in gold packaging which are handy to take with you in your bag in case you want to wash your aligners on a sleep over or a weekend away. There is also another reminder brochure entitled “Your smile is just the beginning” which I look at every now and again to refresh my mind and ensure that I am doing everything correctly for my dental health and also to keep the aligners clear and fresh. 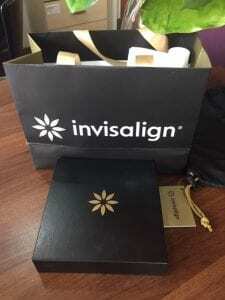 When I received the gold ribboned bag I happily skipped out of the room, ready to start my own “Invisalign Journey”..!